Diversity, diversity, diversity. This is one of those fine words that has been run into the ground through cheap overuse, like awesome, journey, and synergy. Diversity, which means "differentness, multiformity, or variety," is part and parcel of our life today, whether we're talking about choices in a supermarket, channels on cable TV, or the population of the United States. Much of the debate about Christmas has to do with diversity and what we do with it. Those who advocate saying "Happy Holidays" over "Merry Christmas" or "Holiday tree" over "Christmas tree" often point to the diversity of America as a defense of their linguistic position. In fact, they seem to think that the mere fact of diversity in United States makes their case, with no further argument required. This, it seems to me, is a common but pernicious mistake. Not everybody celebrates Christmas. But all Americans do celebrate the holidays. Wishing someone “Happy Holidays” is no attack on Christianity, but it is a recognition of America’s diversity. . . . .
No, there’s nothing wrong with Americans being different. Our diversity is what makes us a great country. Happy Holidays! Press, who claims to be a Christian and "the biggest Christmas junkie of all," nevertheless thinks Christians who are so upset about the prevalence of "Happy Holidays" have been confused by a "phony issue." There's no war on Christmas, according to Press, and "Happy Holidays" is simply a way to celebrate our national diversity. There's much in what Press has said that is worthy of comment. At some point I'd like to examine the notion that "our diversity is what makes us a great country." This seems to me only partly right, and when it stands alone, quite wrong. Our diversity contributes to our national greatness, to be sure. But the greatness of America seems to me more a matter of E Pluribus Unum, the motto on the Great Seal of the United States. This Latin phrase means, "out of many, one." It recognizes our diversity, but celebrates our unity as a diverse people who have come together to make something new. Nevertheless, for now I won't quibble with Press's estimation of the value of diversity without unity. I happen to agree that American diversity is a good thing, even a wonderful thing. Take the example of food. It would get pretty boring if all we had to eat were American foods. When my wife and I go out for dinner, we almost always enjoy some sort of ethnic cuisine: Chinese, Thai, Italian, or Mexican. The diversity, yes, there's that word again, of food options in my world makes it much richer and more enjoyable. 1. America is a diverse nation (when it comes to our holiday celebrations). 2. Our diversity is (part) of what makes us great. The question: How can we celebrate our diversity of holiday celebrations? How can we enjoy and magnify this aspect of American greatness? Bill Press's answer is that, among other things, we should say "Happy Holidays" rather than "Merry Christmas" when we're in diverse company. (I assume Press thinks it's okay for me to say "Merry Christmas" to other Christians.) Is he right? Does this reflect and celebrate our diversity? It seems to me that the opposite is true. "Happy Holidays" doesn't reflect diversity. Rather, it imposes a sort of benign, boring uniformity upon us all. When real Americans are celebrating Christmas, Hanukkah, Kwanzaa, Pancha Ganapati (Hindu gift-giving festival from December 21-25), Winter Solstice, and New Years, "Happy Holidays" lumps together all of this wonderful, rich diversity in a mass of dreary sameness. Wouldn't it be a greater and truer celebration of diversity to recognize and enjoy the variety of Winter holidays, rather than minimizing this diversity with a no-name greeting like "Happy Holidays"? Let me provide yet another culinary example. My daughter's public elementary school is going to have a big party tomorrow, the last day before Christmas vacation, oops, Winter Break. No, it's not a Christmas party, nor even a generic holiday party. Rather, it's an "International Food Festival." As my daughter's invitation reads, "Your [student] is invited to participate in a joyous celebration of cultural diversity." And how will this happen? "We're inviting you and your child to create a favorite dish related to his or her culture. . . . Also, please include a notecard created by your child explaining the food." Now I realize that some Christians might be bugged because the traditional Christmas party has been replaced by a food festival. (I'll say more about why I'm not so bothered in my next post.) And it's easy to be cynical when faced with an overused phrase like "joyous celebration of cultural diversity." But, I believe that my daughter's school has come up with a clever way to have a fun party without getting into the messiness of religious celebrations, something schools like to avoid in our hyper-litigious culture. Moreover, school leaders have found a way to highlight and celebrate genuine diversity, rather than trying to ignore or squelch it. Given his statements on diversity and the holidays, if Bill Press were in charge of my daughter's school, he'd no doubt insist that all students eat the same dish: some bland, indistinct, and hopelessly "undiverse" mush. This way nobody would be forced to experience actual diversity. There would be no chance that somebody might insult somebody else's food as being "yucky." And, Higher Power forbid, nobody would be able to bring food that has religious meaning, such as latkas (Jewish potato pancakes eaten at Hanukkah) or a tray of sweets offered to Lord Ganapati (part of the Hindu celebration of Pancha Ganapati). In reality, it seems that the folks who are really upset about public recognition of specific holidays aren't usually Christians, Jews, Hindus, Muslims, and so forth, but rather those who would prefer that religion in America disappear from public altogether. "Keep it at home and in church (or synagogue, or mosque, or temple)," is the secularist motto when it comes to religion, including religious holidays. So, "Happy Holidays" really isn't so much a matter of celebrating diversity as it is a means to squelch diversity. It masks and diminishes the genuine variety of cultures in America. One might argue that genuine religious diversity ought to ignored or hidden away. But please don't try to fool me with a plea to diversity if you're going to argue for non-specific sameness. Last Thursday I received my local newspaper, The Irvine World News. On the top of the front page there was a small menorah (Jewish candelabra used for Hanukkah). This picture linked to an article on the first page of the "Connections" section. Turning there, I saw a much larger menorah that dominated the page. The article it illustrated wasn't even about Hanukkah so much as a Jewish song and dance troupe that presented Hanukkah songs. One could even say that the menorah was superfluous. How did I, as a Christian, feel about having a Jewish religious symbol placed before my eyes by the Irvine World News? Great, relieved, thankful. In fact, I was so grateful for the willingness of my local paper to draw attention to an actual religious holiday that I did something I rarely ever do, and wrote a letter to the editor of the paper. 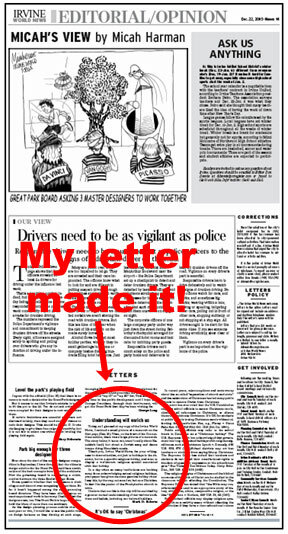 As it turns out, my letter made it into today's edition of the Irvine World News. Since it's a little hard to read in the photo to the right, I'll finish this blog post by reproducing my letter. Today, as I glanced at my copy of the Irvine World News, I noticed a small picture of a menorah on the first page (Dec. 15). 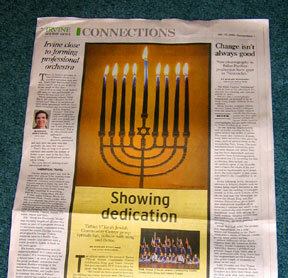 Then, on the front of the Connections section, there was a large picture of a menorah. The story below, it turns out, wasn’t really about Hanukkah itself, but about a Jewish song and dance troupe doing Hanukkah music. Thank you, Irvine World News, for your willingness to draw attention, not just to holidays in the abstract, but to a specific religious holiday, and even to display a well-known religious symbol associated with that holiday. In a day when so many institutions are backing away from acknowledging actual religious holidays, your paper has given me some genuine holiday cheer. I say this, by the way, not as a Jew, but as a Christian. In fact I’m the pastor of the Presbyterian church in town. I believe that our life in this city will be enriched by a greater mutual understanding of our various traditions and beliefs, including our beloved holidays. Above: "Connections" section of last week's Irvine World News. Home. Do you have a comment about this post? Either e-mail me or visit my guestbook. Thanks. In my last post I expressed my concern over the effort to strip away the genuine diversity of our country by turning the various holiday traditions of real people into an indistinct mush of "Happy Holidays." Today one of my blog readers alerted me to a sad example of this trend (thanks, Winston!). It seems that the Paseo Colorado shopping center in Pasadena, California, has decided not to allow a local Jewish group to put up a 13-foot-tall menorah on its property, though they had done so in recent years. Yet Paseo Colorado will continue to display a giant Christmas tree. What is the rationale for such an odd decision? Management for Paseo Colorado is trying to eliminate all religious displays on its property. The Christmas tree, according to management, is "not religiously affiliated. It's just holiday décor that's become part of the décor this time of year." Not religiously affiliated? Don't you love that line?! What will come next? This is a new and unhappy twist on a familiar theme. Lowe's Home Improvement Centers sold "Holiday trees" rather than "Christmas trees." And Wal-Mart, the Mecca of Christmas shopping, replaced "Merry Christmas" with "Happy Holidays," providing one of the strangest explanations on record and leading to a boycott of Wal-Mart by conservative Christians. As a citizen of the United States, I'm saddened by the increasing tendency in our society to eject religion from the public square and to neutralize genuine diversity with such phrases as "Happy Holidays." I explained all of this in my last post. As a Christian, however, I'm not worried about whether Wal-Mart wishes me "Merry Christmas" or "Happy Holidays." You see, I believe that Christmas is most of all the celebration of the birth of Jesus, and I'm not at all convinced that a "Merry Christmas" from a Wal-Mart employee will promote what Christmas is really all about. In fact, I'm more inclined to believe that the connection of Christmas with frantic consumerism diminishes the real meaning of Christmas, rather than augmenting it. I'd rather Wal-Mart have less to do with Christmas, not more. So I find myself in two minds when it comes to the "Merry Christmas – Happy Holidays" debate. As an American, I believe our society is being impoverished by the banishment of religious symbols and traditions from public places, like the Paseo Colorado. As a Christian, I'm not altogether happy with the extent to which Christmas has been secularized and commercialized, and I almost like the separation between Christmas and Wal-Mart. Moreover, I don't expect Wal-Mart, or Paseo Colorado, or the government to do what Christians are called to do, and this is to spread the good news of the birth of Jesus, not to mention His death and resurrection. So when Christians, acting as Christians, boycott Wal-Mart over the "Happy Holidays" issue, or argue for calling the national pine tree a "Christmas tree" rather than a "Holiday tree," I get nervous. I also think we Christians can end up wasting our energies seeking a goal which, even if it's good, doesn't really get to the heart of the matter. If Christian pressure on Wal-Mart leads to a restoration of "Merry Christmas," I'm not convinced this has helped people understand or celebrate the core of Christmas. And it may in fact have turned off a lot of folks in the process. It seems to me that we Christians could do much better. We have a whole lot of freedom to do all sorts of things that will promote both the recognition of Christmas and its genuine celebration. We don't need the government's help, or the sponsorship of Wal-Mart, to do these things. Using the freedoms and resources at our disposal, I believe we can and should make the most of Christmas in the public arena. Let me explain what I mean. I want people in my sphere of influence to know what Christmas is really all about and to feel welcome, though not obligated, to join me in celebrating the birth of Jesus. So, I ask myself, what do I have at my disposal to help me accomplish this goal? Well, for one thing, I have the right to decorate my home for Christmas, and to include religious symbols galore. So, for the last several years I've been putting up a large nativity scene on my roof. Might this be offensive to non-Christian folk? you might ask. Not in my experience. I've had three Jewish families, families that practice their Judaism, by the way, tell me they love my nativity scene. I've had many other Christians tell me that my display reminds them what the season is really all about. 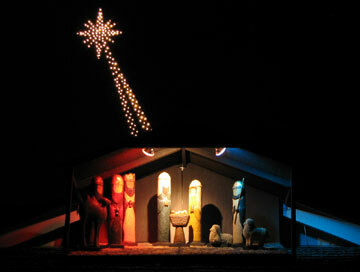 Now I'm not saying that all Christians should put up nativity displays in their front yards. But this is certainly one way for Christians to celebrate Christmas in a public, legal, and welcoming way. The nativity scene on my roof. The figures are about 40" tall. Another option involves the sending of Christmas cards. 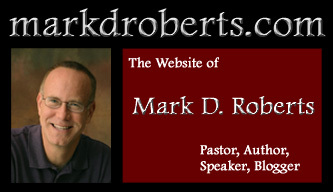 I recently read an encouraging article in the Los Angeles Times, "For This Holiday, Religious Themes are in the Cards." According to this story, religious-themed greeting cards are becoming more popular. The Greeting Card Assn. says that 30% of customers choose Christmas cards with religious messages, and that this number has been on the rise for the last four years. Yet this means that 70% of people who send Christmas cards are not choosing to communicate something about the real nature of Christmas. What a great untapped opportunity! Please, please understand that I'm not advocating in-your-face preachiness. But a tasteful card with religious Christmas symbols and some sort of appropriate greeting will make a positive difference, while offending almost nobody. I have a friend who, for years, has used the occasion of Christmas as a way to reach out to his neighbors. 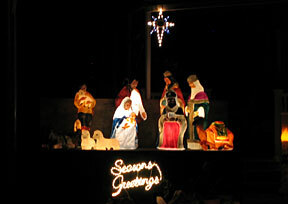 He throws a neighborhood Christmas party, which includes a gathering around an outdoor nativity scene and the singing of carols like "Joy to the World." His neighbors, many of whom are not Christians, love this party and wouldn't miss it for anything. Christmas caroling is another beloved tradition that can spread both Christmas cheer and the true meaning of the season. A caroling group can get away with singing "Silent Night" or "O Come All Ye Faithful" even in fairly secular or non-Christian environments. Most neighborhoods would welcome carolers, as would many homes for the elderly. Churches offer special services around Christmas time (though not necessarily on Christmas Sunday). For the most part these services present the true meaning of Christmas. And they usually attract many visitors, including non-Christian folk. But I think churches could use the Christian season much more creatively to draw people, not only to church, but to God. For example, the junior high group in my church has an annual tradition of wrapping Christmas presents in a local shopping plaza. They do this free of charge, and don't accept donations even if they are offered. The sign for the free wrapping identifies the group as from IPC, rather than Irvine Presbyterian Church, because we don't want to scare people away who fear they might be coerced into getting a religious spiel. If people ask where we're from, we say "Irvine Presbyterian Church." This ministry has touched the hearts of many. Last year a woman wept because she said she had never experienced such no-strings-attached grace from a church. The ideas I've described in this post are just a few among many possibilities. My point is that, rather than organizing boycotts of stores that say "Happy Holidays," we Christians should focus on actions that will bear sweeter fruit because the actions are gracious and inclusive, rather like Christmas itself. We can find many ways to emphasize the true meaning of Christmas and to embody this meaning in tangible acts of giving. In this way we can make the most of the opportunity afforded to us by Christmas, pointing unabashedly to the real meaning of this holy day, and inviting folks to join us as we celebrate the birth of the Savior.